Suddenly, he’s the most popular kid on the street – and no wonder. He owns the ‘newest, finest bike in town. It is a good bike, well-made, of the best materials. Strong, speedy, safe. But something new rings bells with the gang. Well, I thought I’d seen it all. Having discovered the 1950 Huffman Dial-Your-Ride, with the largest front fork known to humanity, I didn’t think that any bicycle manufacturer could trump it. 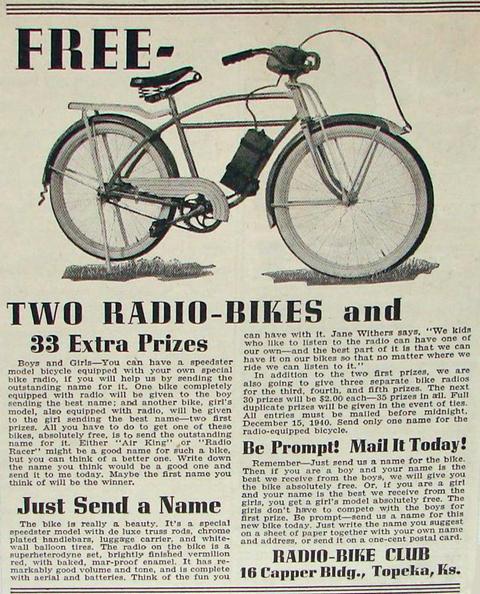 But, just a few years later, the same company introduced what is undoubtedly the most innovative idea in fifties bicycles …a Radiobike. 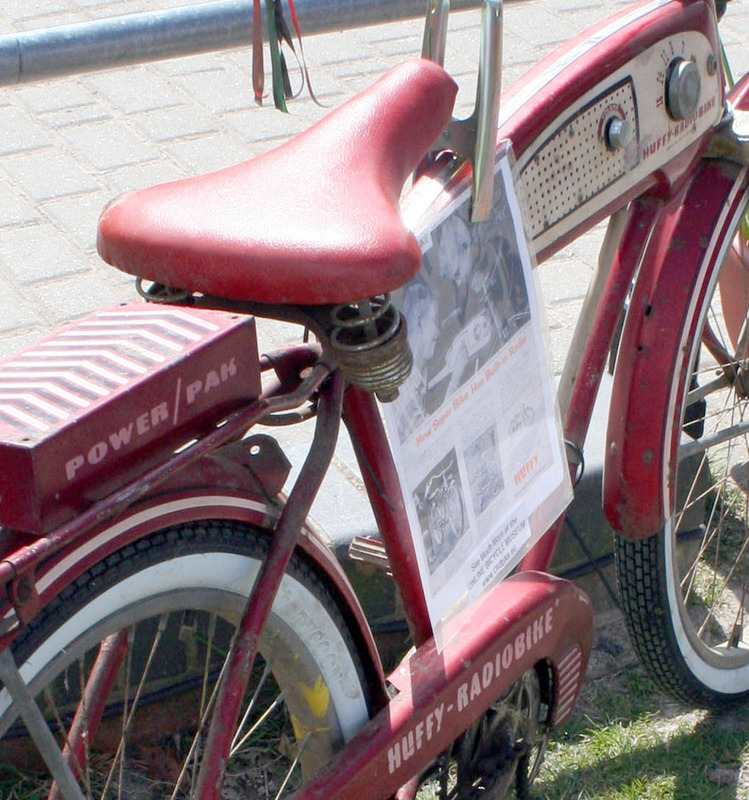 The Huffy Radiobike was introduced halfway through 1955, and only appeared in the next year’s catalogues. 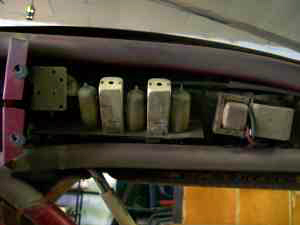 The radio is located in the ‘gas tank’ and uses vacuum tubes. 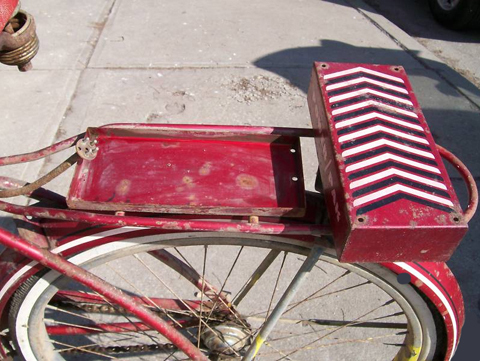 The high voltage bias supply for the tubes and associated battery pack are on the rear rack. It’s interesting to note that the transistor radio came onto the market around the same time, but was still an expensive item, costing in the region of $40 + tax. 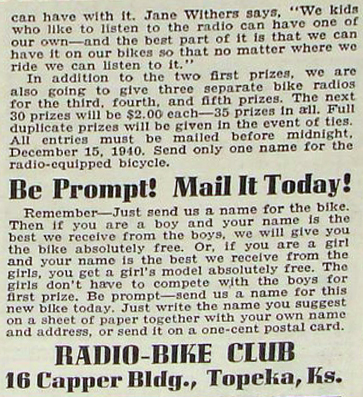 The Radiobike did not cost much more than that. 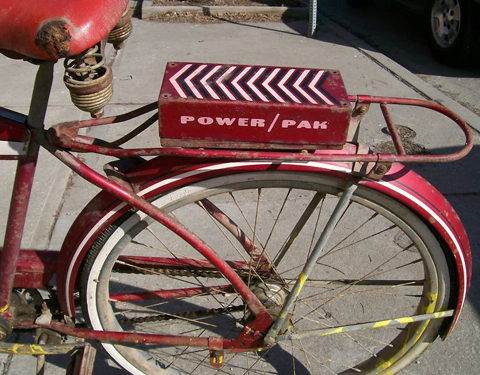 Although valve radios would soon be obsolete, the bicycle was not affected by this new technology, and the Radiobike was manufactured for over three years. This old bone came from an antique dealer in Kansas City. 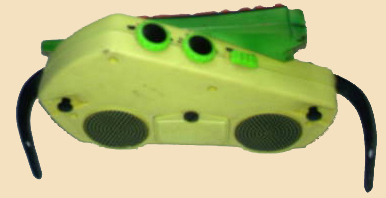 It has yellow paint splattered around it, is missing its headlight, and shows other signs of neglect. But it will soon be cleaned up and installed with new whitewall tyres. Goodness knows how I’ll fix the radio, but it will be an interesting exercise. Not sure I’ll be the ‘most popular kid on the street’ with ‘newest, finest bike in town’ but you can be sure that I’ll have a laugh riding it along Brighton seafront and amusing the passers-by. 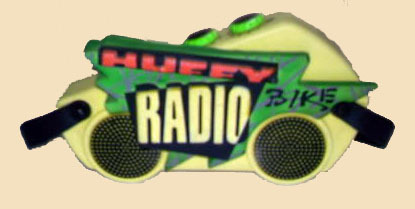 An interesting footnote: in 1992, Huffy made another ‘Radiobike.’ This one did not have valves, and was a much simpler affair – a radio that you could attach to your bicycle. 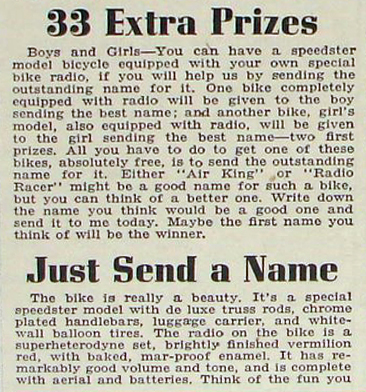 ‘…Remember – Just send us a name for the bike. Then if you are a boy and your name is the best we receive from the boys, we will give you the bike absolutely free. Or, if you are a girl and your name is the best we receive from the girls, you get a girl’s model absolutely free. The girls don’t have to compete with the boys for first prize.